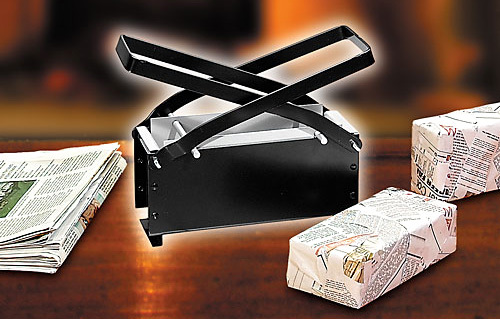 OGCC Day 8 – Newspaper Fireplace 'Log' Maker | OhGizmo! There’s nothing like the feeling of cozying up to a warm fire on a cold Winter (or Autumn) night. But believe it or not you can actually improve that feeling with the satisfaction of knowing the fire is also being used to recycle old newspapers. All you have to do is fill this ‘brick maker’ with dampened sheets of newsprint, press out as much water as you can and then let them dry. What you’re left with is a tightly-formed paper briquette that’s easy to light and will burn a lot longer than just crumpled up paper. Let’s face it, the Winter’s not the best time of the year if you’re worried about your carbon footprint. Besides heating bills, you probably also have quite a collection of festive lighting all over the house, not to mention the non-stop parade of Christmas specials on TV you have to watch. So being able to re-use those old newspapers as a source of heat (and atmosphere) is a win-win situation. The Brick Maker is available from Taylor Gifts for $29.98. I cant see that to be ok to breathe in. I have a feeling inks and whatever chemicals are used in the paper themselves are not lung friendly. Actually, I think some of the fumes will highly toxic and neither environmentally friendly nor healthy. On top of that, paper should be recycled, and at least partially used for paper making or cardboard making. After that it could still be used as fuel, but please not in a fireplace. Most of the heat (and toxic fumes) goes through the chimney . Must say I completely agree with stef. Most newspaper ink is soy-based these days, so it’s not toxic, unless you are burning plastic. Inks are almost all soy based these days making burnoff waste very similar to what you would get burning a log. In fact if you burn your wood too green (that is wet or unseasoned, not eco friendly!) it is much worse because of the amount of creosote it puts off.